Obviously the picture below is missing Telfer but it's been such a sweet time together as a family of four. There are of course the usual sleepless nights with an infant and the occasional two-year-old meltdown, but with help from our sets of parents and Elizabeth as well as an army of delicious meals from Telfer's colleagues and friends from church, we have managed quite well. My parents stayed with us the first week Jane and I were back in Oympia. I was still a bit of mess and basically went back and forth between the bed and the couch. Not only did my parents cook and play with Cate and help me with the baby, but yes, they worked on our house. Dad did a bunch of electrical projects and then helped Mom scrape even more wallpaper off of our upstairs bedroom and landing area…hard work. 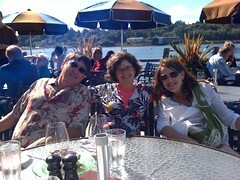 By the time they were getting ready to leave, I was feeling good enough to go out to lunch for my mom's birthday. This is what our bedroom looked like before my parents arrived. They completely finished scraping off the wallpaper so Telfer could paint the room. 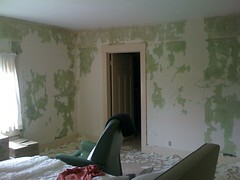 Mom figured out that vinegar works well to loosen wallpaper and the entire house smelled like apple-cider vinegar. Worth the smell to sleep in your own bed. 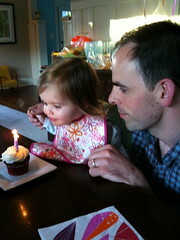 We celebrated Cate's birthday on October 6. Our house is directly across the street from a bus stop for the Dash, a free shuttle that goes to the Capitol Campus and downtown Olympia. Cate is understandably very interested in the bus – every 15 minutes when she hears the bus go by she shouts, "bus!" from wherever we are in the house. 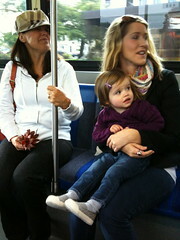 So on Cate's birthday morning, Cate, Mendy, Elizabeth, Jane and I crossed our street and actually got on the bus. It was so very fun. The look in Cate's eyes… We rode all the way down to the Bread Peddler for morning rolls. Later that night we had dinner and cupcakes and presents. Ask Cate if she is two, she will say, "cupcake?" Smart girl. Daddy taught her to blow out her candles and she liked it so much we relit them a couple of times so she could have the pleasure of blowing them out again. Baby Jane Josephine is delightful. She is such a sweet little package. I think she weighs about 6.5 pounds now if I had to guess. 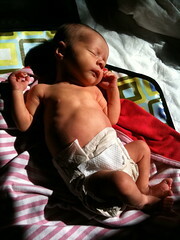 I had a twinge of real sadness when she grew out of her first preemie outfit at the end of last week. Cate has adjusted to having a little sister very well. 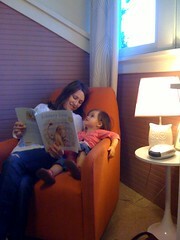 She is interested in Jane's well-being and all her activities (crying, pooping, sleeping). Jane and I have both had colds which has made for some recent long nights. Mostly this last month has been occupied with moving into our house. Telfer had much of the furniture in place and most of the big projects done when I got home but our garage was completely stuffed with boxes. Once the upstairs was painted, we could finally completely move in. Elizabeth continued to work as our nanny so I could take care of Jane and get our home settled. I worked like a madwoman. It was part fun and part manic. But! I got a lot done! For unpacking the kitchen though, I needed Elizabeth's help. 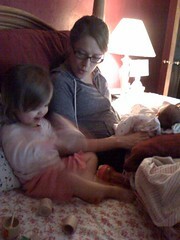 Cate went to Grammy's house for the night and Elizabeth and I set to work. 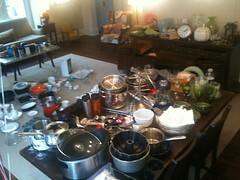 This is a picture of just some of the kitchen items that needed to be sorted through, washed and put away. It looks like a pile of yard sale junk! Our house is mostly organized and decorated now. We are loving living here. We still have lots of projects to work on (trim painting, back entry, a few stray boxes) but all of those can wait for the occasional weekend. Many wonderful moments this month. I have been overcome with thankfulness at times – reading to Cate or making a salad or out to lunch with Telfer and Jane. I love this life. So many things to thank our Lord for. Great update! So glad all is well with you and your family. And I love the ‘hello, pumpkin’ picture of Cate. nice, and lots of pictures! your post makes me so happy. So happy to hear that things are going well. You’ve been on my mind and heart! Take care!